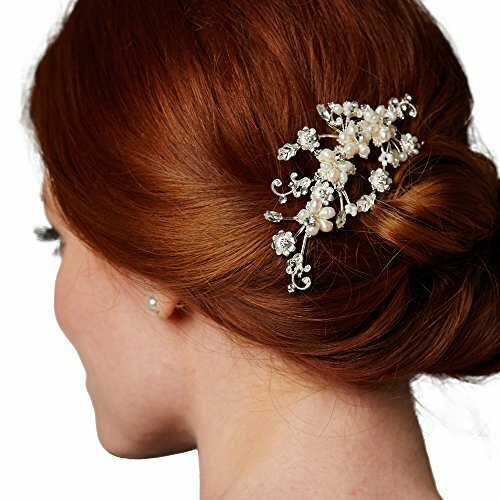 A truly gorgeous handmade headpiece of keshi pearl and freshwater pearl flowers, and softly glimmering silver metal flowers, this side-stylized headpiece will instantly adds glamour to any hairdo. Sparkling with Austrian crystal rhinestones, it definitely is sure fire to wow guests at your wedding or any other special occasion you are planning on. This headpiece also makes an amazing hair accessory for your bridesmaids. Plated with genuine sterling silver and covered with anti-tarnishing electro coating, it is 100% risk-free guaranteed if not completely delighted. Fresh Water Pearl Tiara is one of our most exquisite and exclusive designs. The craftsmanship is just breathtaking. It is intricately hand-wired with a spectacular array of Freshwater Pearls, and glistening Rhinestones. The lavish floral detailing measures 8 ¾ inches along a silver-plated band. The center peak measures just under 2 inches tall. The Fresh Water Pearls are a soft, off-white shade of color and will coordinate with both white and ivory wedding dresses. This beautiful tiara most definitely has the "wow" factor. 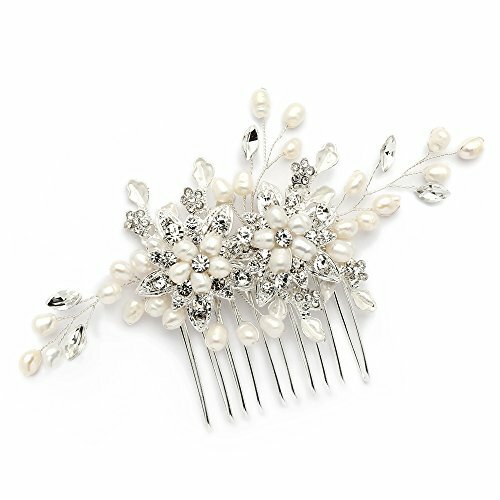 Made with Genuine Freshwater pearls and Austrian pave crystals, this floral bridal comb is truly a work of art. It measures 4" w x 2 3/4" h, and the silver and pearl sprays can be adjusted to form the perfect complement to your wedding or party hairstyle. Whether tucked behind your ear or slipped into un updo or low swept bun, we promise you'll make an unforgettable statement in this top selling headpiece. Treat yourself or someone you love to some seriously romantic sparkle with this fabulous side comb. After the special day, wear this nature-inspired hair accessory for honeymoon walks on the beach, romantic candlelight dinners or summer cocktail parties - for a glistening finishing touch. Fall in love with this incredibly popular and irresistibly affordable hair accessory or your money-back. Lifetime Guarantee. A bouquet of genuine Freshwater pearls with crystal-studded flowers create this irresistible garden-inspired headpiece with soft feminine appeal. 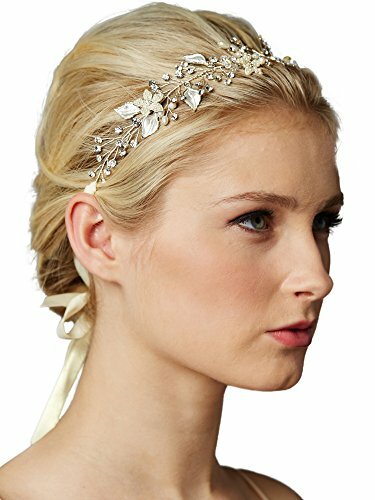 Add floral perfection to your wedding day tresses with this gorgeous light silver hair accessory. We love this organic bridal headpiece worn as a dramatic side comb or nestled into a low-swept bun or updo. Mariell's romantic garden comb is 4 1/2" w x 2 1/4" h. We promise you'll love this best-selling special occasion headpiece or your money-back...guaranteed. 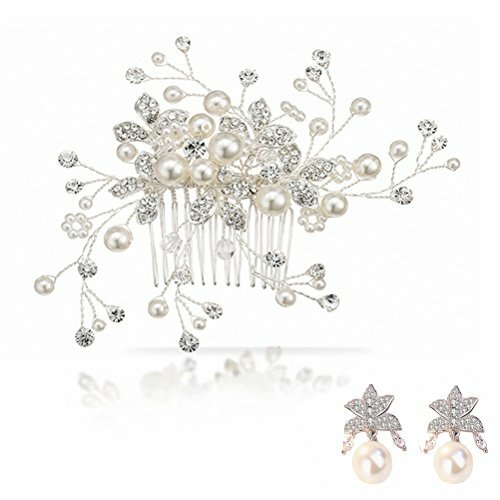 1.These rhinestones covered filigree leaves and floating pearls create a stunning bridal hair comb. This is a beautiful piece and will add the perfect touch to your wedding look. 2.Suitable for weddings, engagements, proms, parties, pageants or any occasion you want to be more charming. 3.It's easy to put into the hair and take out but you may use extra pins to secure it in case. Make your grand entrance unforgettable in this incredibly romantic hand-made Silver hair vine by Mariell. 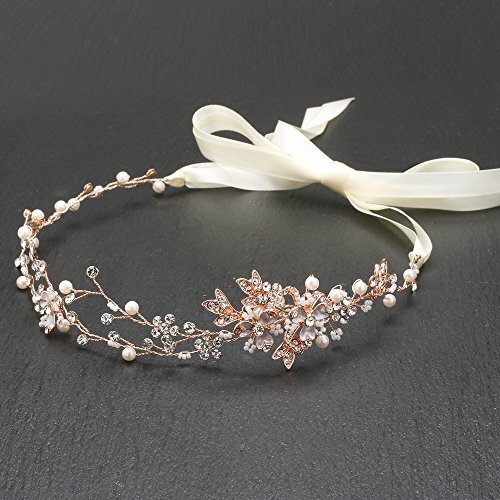 Our spectacular headband features Genuine Freshwater pearls and hand-enameled silvery matte leaves in a breathtaking crystal and pearl floral garden. The finishing touches are an intricate array of dainty Ivory pearls, delicate seed beads and hand-wired Austrian crystals sprays. With its flexible design, you can create your one-of-a-kind hairstyle by positioning each sparkling sprig to adorn your upswept locks or naturally flowing hair. The organic styling of this stunning whimsical headpiece gives this Mariell ribbon headband its couture runway look. 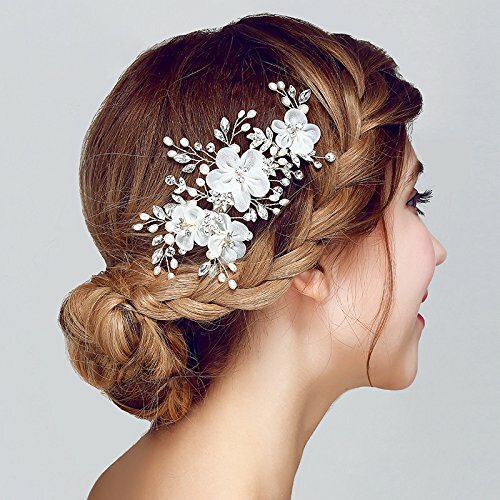 With 10" of meticulously hand-wrought sprays adorning your tresses and 16" of double satin ivory ribbons on each side, this 1 1/4" w hair accessory guarantees you'll make a bridal statement fit for a celebrity wedding! Wear this delicate boho style halo anytime for an ethereal, and head-turning designer look with nature-inspired beauty. 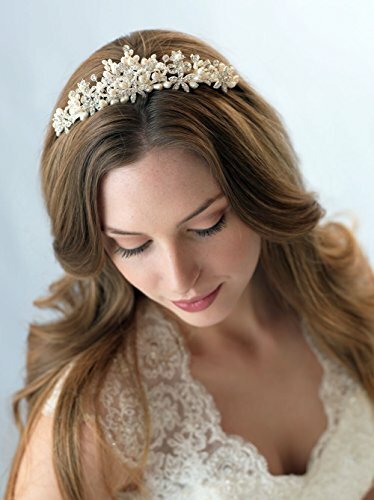 We promise you'll love this best-selling silver headpiece or your money-back. Treat yourself or someone you love to some serious glamour! Hand-crafted and plated in Genuine Silver Platinum plated. Hand-brushed matte silver leaves plated in genuine Platinum and meticulous artisan craftsmanship define this hand-wired bridal comb. 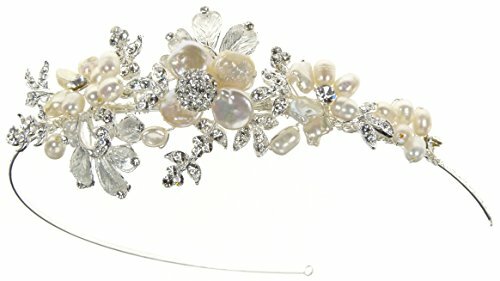 With lustrous Genuine freshwater pearls and dazzling pear-shaped Austrian crystals, you'll shine with designer elegance in this stunning and top-selling Mariell headpiece. 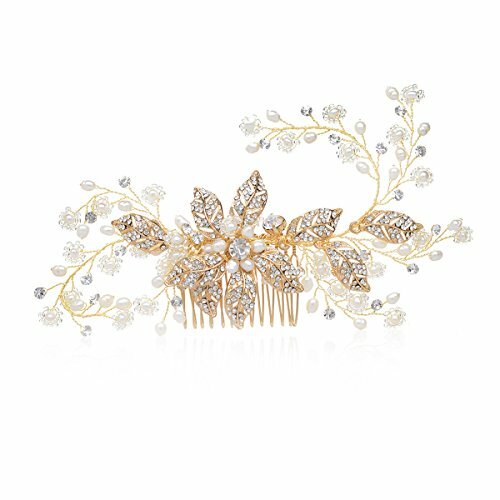 Worn off to the side or tucked into an up-do, this glistening bridal comb with hand-enameled silver foliage is a work-of-art. All eyes will be on you as you make your grand entrance flaunting this breathtaking for floral hair adornment. Our wedding comb is perfect whether worn to a formal country club reception or an exotic destination wedding. After the big day, Mariell's pearl comb is perfect for your honeymoon, a moonlight walk on the beach or a romantic candlelight dinner. 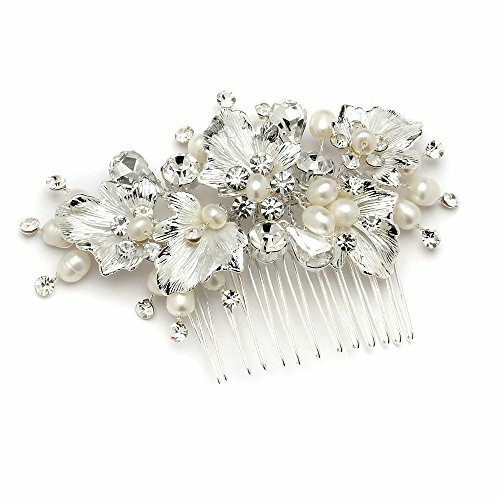 With flexible wired crystals, pearls and leaves, this 4" w x 2 1/2" h comb can be shaped to enhance any hair style. We promise you'll adore this best-selling bridal comb or your Money-Back. Treat yourself or someone you love to some seriously gorgeous wedding day glamour. Our couture styling is available at a fraction of the cost of other high-end hair accessory designers. As always, enjoy Mariell's exclusive 100% Risk-Free Purchase and Lifetime Guarantee. Copyright © Wholesalion.com 2019 - The Best Prices On Freshwater Pearl Headpiece Online.